Measles is a viral infection that causes an illness displaying a characteristic skin rash known as an exanthem. Measles is also sometimes called rubeola, five-day measles, or hard measles. Measles infections appear all over the world. Incidence of the disease in the United States is down to a record low and only 86 confirmed cases were reported in the year 2000. Of these, 62% were definitely linked to foreigners or international travel. Prior to the current effective immunization program, large-scale measles outbreaks occurred on a two to three year cycle, usually in the winter and spring. Smaller outbreaks occurred during the off-years. Babies up to about eight months of age are usually protected from contracting measles, due to antibodies they receive from their mothers in the uterus. Once someone has had measles, he or she can never get it again. Measles is caused by a type of virus called a paramyxovirus. It is an extremely contagious infection, spread through the tiny droplets that may spray into the air when a person carrying the virus sneezes or coughs. About 85% of those people exposed to the virus will become infected with it. About 95% of those people infected with the virus will develop the illness. Once someone is infected with the virus, it takes about seven to 18 days before he or she actually becomes ill. The most contagious time period is the three to five days before symptoms begin through about four days after the characteristic measles rash has begun to appear. The first signs of measles infection are fever, extremely runny nose, red, runny eyes, and a cough. A few days later, a rash appears in the mouth, particularly on the mucous membrane that lines the insides of the cheek. This rash consists of tiny white dots (like grains of salt or sand) on a reddish bump. These are called Koplik’s spots, and are unique to measles infection. The throat becomes red, swollen, and sore. A couple of days after the appearance of the Koplik’s spots, the measles rash begins. It appears in a characteristic progression, from the head, face, and neck, to the trunk, then abdomen, and next out along the arms and legs. Many patients (about 5–15%) develop other complications. Bacterial infections, such as ear infections, sinus infections, and pneumonia are common, especially in children. Other viral infections may also strike the patient, including croup, bronchitis, laryngitis, or viral pneumonia. Inflammation of the liver, appendix, intestine, or lymph nodes within the abdomen may cause other complications. Rarely, inflammation of the heart or kidneys, a drop in platelet count (causing episodes of difficult-to-control bleeding), or reactivation of an old tuberculosis infection can occur. An extremely serious complication of measles infection is the inflammation and subsequent swelling of the brain. Called encephalitis, this can occur up to several weeks after the basic measles symptoms have resolved. About one out of every 1,000 patients develops this complication, and about 10–15% of these patients die. Symptoms include fever, headache, sleepiness, seizures, and coma. Long-term problems following recovery from measles encephalitis may include seizures and mental retardation. 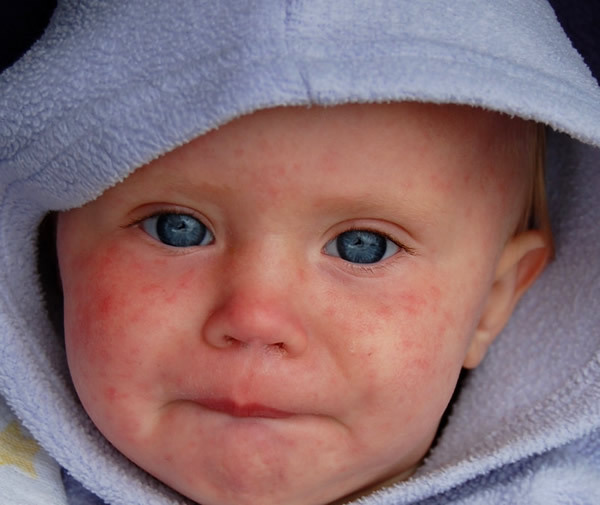 A very rare complication of measles can occur up to 10 years or more following the initial infection. Called subacute sclerosing panencephalitis, this is a slowly progressing, smoldering, swelling, and destruction of the entire brain. It is most common among people who had measles infection prior to the age of two years. Symptoms include changes in personality, decreased intelligence with accompanying school problems, decreased coordination, and involuntary jerks and movements of the body. As the disease progresses, the patient becomes increasingly dependent, ultimately becoming bedridden and unaware of his or her surroundings. Blindness may develop, and the temperature may spike (rise rapidly) and fall unpredictably as the brain structures responsible for temperature regulation are affected. Death is inevitable. Measles during pregnancy is a serious disease, leading to increased risk of a miscarriage or stillbirth. In addition, the mother’s illness may progress to pneumonia. 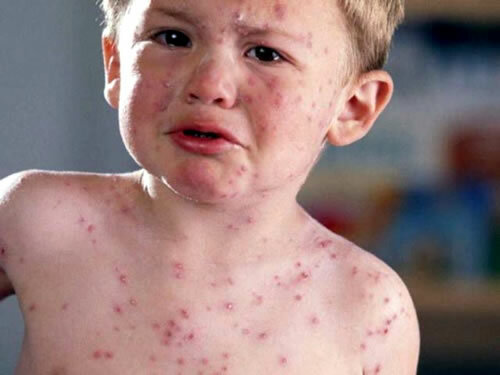 Measles is almost always diagnosed based on its characteristic symptoms, including Koplik’s spots, and a rash that spreads from central body structures out towards the arms and legs. If there is any doubt as to the diagnosis, then a specimen of body fluids (mucus or urine) can be collected and combined with fluorescent-tagged measles virus antibodies. Antibodies are produced by the body’s immune cells that can recognize and bind to markers (antigens) on the outside of specific organisms, in this case the measles virus. Once the fluorescent antibodies have attached themselves to the measles antigens in the specimen, the specimen can be viewed under a special microscope to verify the presence of the measles virus. Echinacea plus goldenseal to clear infection, boost the immune system, and soothe skin and mucous membranes. A tea of lemon balm leaf, chamomile flower, peppermint leaf, licorice root, and elder flower to reduce fever and chills and increase perspiration. Ginger tea to reduce fever. Shiitake mushrooms to boost the immune system. Witch hazel (Hamamelis virginiana), chickweed (Stellaria media), or oatmeal baths to reduce itching. Eyebright (Euphrasia officinalis) eyewash to soothe eyes. Garlic to fight infection and boost the immune system. Flos lonicerae (10 g) and Radix glycyrrhizae (3 g) decoction to wash the mouth, eyes, and nose. Some studies have shown that children with measles encephalitis or pneumonia benefit from relatively large doses of vitamin A. Vitamin A may also heal mucous membranes. Bioflavinoids and vitamin C boost the immune system. Zinc promotes healing and is an immune system stimulant. Zinc can cause nausea and vomiting, and chronic use can cause low levels of copper and iron-deficiency anemia. Apis mellifica: for swollen throat, breathing difficulty, and painful cough. Arsenicum album: for restlessness, feeling worse after midnight, and thirst. Belladonna: for high fever, red eyes, flushed face, headache, and swallowing difficulty. Gelsemium: for fever, droopy eyes, cough, feeling cold, and runny nose. Pulsatilla: for eye problems (tears, drainage, light sensitivity), dark red rash, thick yellow nasal discharge, and dry cough. There are no medications available to cure measles. Treatment is primarily aimed at helping the patient to be as comfortable as possible, and watching carefully so that antibiotics can be started promptly if a bacterial infection develops. Fever and discomfort can be treated with acetaminophen (Tylenol) or ibuprofen (Advil, Motrin, Nuprin). Children with measles should never be given aspirin, as this increases the risk of the fatal disease Reye’s syndrome. The prognosis for an otherwise healthy, well-nourished child who contracts measles is usually quite good. In developing countries, however, death rates may reach 15–25%, as malnutrition, especially protein deficiency, for six months prior to the onset of measles increases the risk of death. Adolescents and adults usually have a more difficult course. Women who contract the disease while pregnant may give birth to a baby with a hearing impairment. Although only one in 1,000 patients with measles will develop encephalitis, 10–15% of those who do will die, and about another 25% will be left with permanent brain damage. Measles is a highly preventable infection. A very effective vaccine exists, made of live measles viruses that have been treated so they cannot cause infection. The important markers on the viruses are intact and cause the immune system to produce antibodies. In the event of a future infection with measles virus the antibodies will quickly recognize the organism and eliminate it. Measles vaccines are usually given at about 15 months of age. Prior to that age, the baby’s immune system is not mature enough to initiate a reaction strong enough to ensure long-term protection from the virus. A repeat injection should be given at about 10 or 11 years of age. Outbreaks on college campuses have occurred among nonimmunized or incorrectly immunized students. Surprisingly, new cases of measles began being reported in some countries—including Great Britain—in 2001 because of parents’ fears about vaccine safety. The combined vaccine for measles, mumps, and rubella (MMR) was claimed to cause autism or bowel disorders in some children. However, the World Health Organization (WHO) says there is no scientific merit to these claims. The United Nations expressed concern that unwarranted fear of the vaccine would begin spreading the disease in developing countries, and ultimately in developed countries as well. Parents in Britain began demanding the measles vaccine as a separate dose and scientists were exploring that option as an alternative to the combined MMR vaccine. Unfortunately, several children died during an outbreak of measles in Dublin because they had not received the vaccine. Child mortality due to measles is considered largely preventable, and making the MMR vaccine widely available in developing countries is part of WHO’s strategy to reduce child mortality by two-thirds by the year 2015.